I was intending to pace myself during Noir City Austin, but I wound up getting paced by external forces. The gameplan for today was to skip the morning shows, sleep in, walk the dogs, go to movies for a few hours in a row, be home around 10:30 this evening. 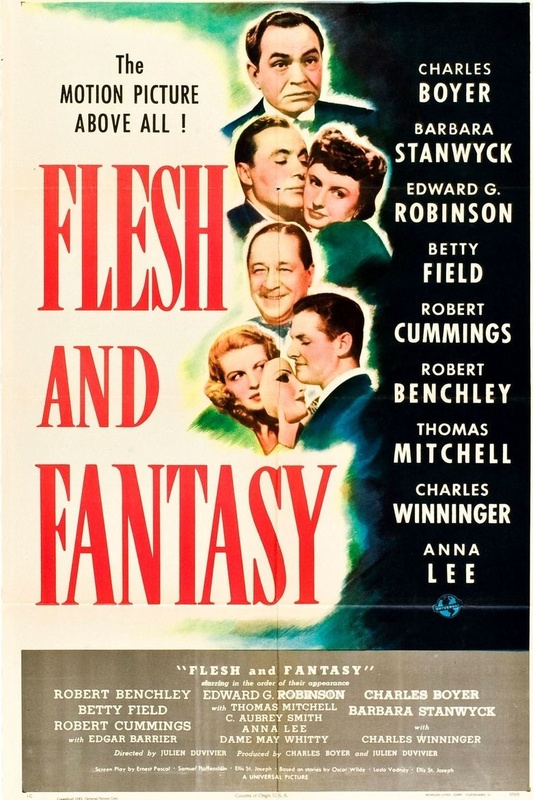 So, I made it out for the 3:00 - 6:15 double-bill of Flesh and Fantasy (1943) and Destiny (1944), and Jamie had even come to meet me for the 6:45 show of Scarlet Street, but during Destiny, I started getting an upset stomach - which I think was from just a combo of things I ate - and I was all sweaty and clammy and wasn't sure how I was doing, so we went home and I made her watch Criss-Cross instead. 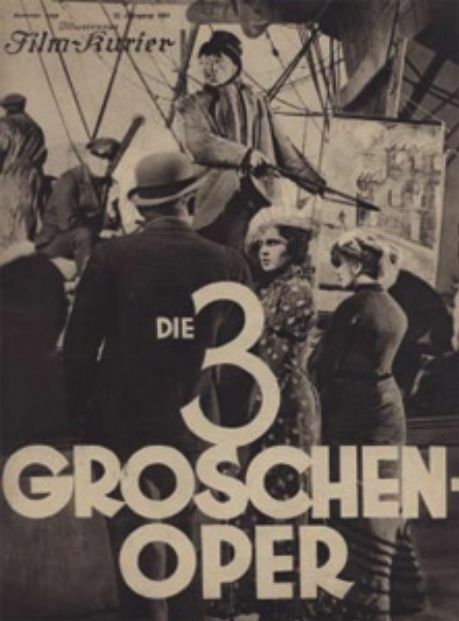 But, man, the double-bill I did catch was pretty terrific, even if Noir Czar Eddie Muller admitted, it wasn't really noir, but more of a rare opportunity to catch a couple of films that aren't really in release anywhere, and that we were watching new prints from Universal. 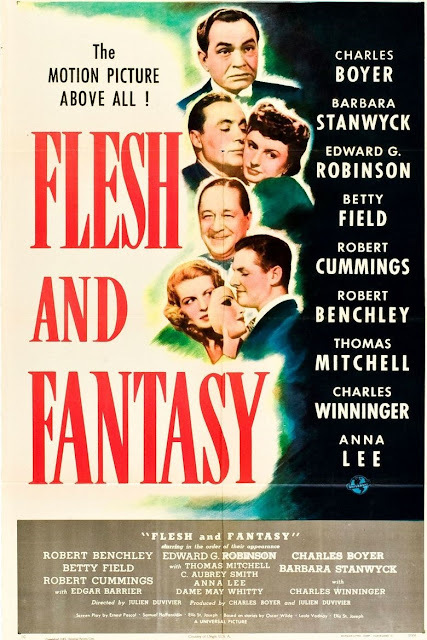 Flesh and Fantasy (1943) is a fascinating experiment that feels 85% complete, but learning that the film had studio fingerprints all over it explained a tremendous amount. Essentially three tales hovering between magical realism and pre-Twilight Zone ironic and uncanny, the stories are held together with a studio-created book-ending mechanism of Robert Benchley being read three tales that relate to his current predicament of not being sure whether to believe a dream he had or a gypsy's fortune. Oh, FX Network. 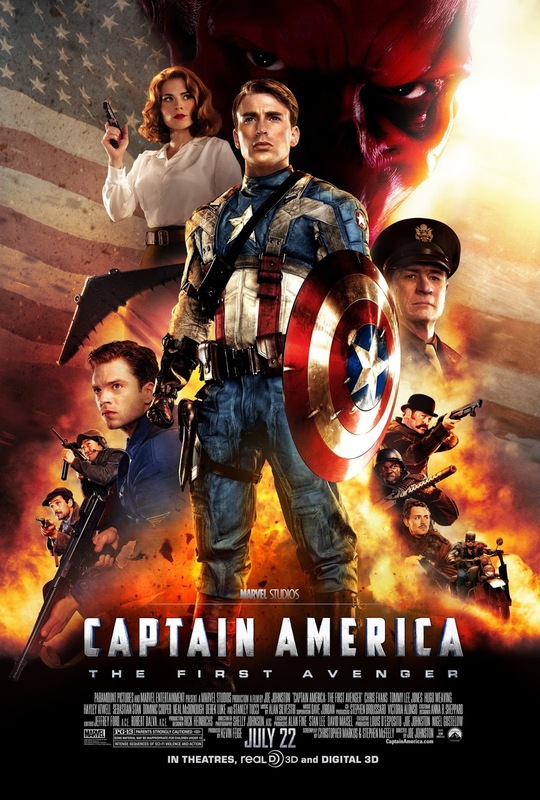 I know when you aren't playing some of my favorite shows (Fargo, The Americans, Louie, Baskets...) your other primary job seems to be playing Captain America: The First Avenger (2011) on what seems to be an infinite loop. You're following the 1990's TBS Raiders of the Lost Ark model, and it worked for them there, and it's working for you here. 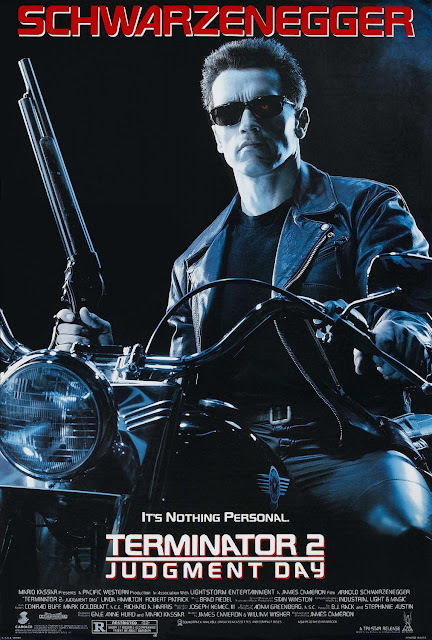 I don't always write up or post when I watch a movie on cable, especially if its one I've seen before, especially multiple times, as I usually wander in after the beginning and don't always make it to the end. But CA: The First Avenger is one that I seem to turn on as I'm flipping channels, some time will pass and suddenly and I'll realize I'm finding myself watching Peggy Carter talking to Steve about meeting him at the Stork Club as the Flying Wing plunges into the Atlantic. I wouldn't say this is a perfect movie from a technical standpoint - and the CGI breaks down here and there (even as Skinny Steve still looks seamless to me). But, man, it works for me. And not just because of Hayley Atwell (which doesn't hurt). Well, the marketing wasn't all there for this movie, and it didn't make a mint, but, boy howdy, the sequels did just fine, it seems. And we got two good seasons of a spin-off TV show with Peggy Carter, which happened to be one of the few watchable things on network TV in the past couple of years. Anyway, I dig this movie, and I should probably not just turn it on and leave it on as much as I do, but there you have it. *I cannot tell you how annoyed I get at the idea that audiences of the modern era are more "sophisticated". Watching a ton of TV doesn't make you more sophisticated, but it will train you to expect certain things. I sat through two movies from the 1940's last night with an audience that giggled at anything they didn't understand like a herd of middle-school kids. The techniques change and symbolism and execution change with technology and perception, but your hip, modern ideas are going to look positively quaint in fifteen years, so, get over yourself, you knobs. It's gonna be interesting but a bit of a marathon as each showing is a double-bill, and there are three showings on each day Saturday and Sunday. The whole deal is hosted by Film Noir Foundation founder and President, Eddie Muller, whom you may have seen on TCM last summer, in interviews about the film noir genre, or popping up wherever film noir is found. Muller is a terrific author (from what I've read) - writing scholarly works on the genre. He also works to promote the preservation of film noir, restoring films and uncovering lost movies. And, I really think he and the Film Noir Foundation have been responsible for a resurgence and growth in interest in noir beyond the 10 or so films folks name-drop when it comes to noir classics. 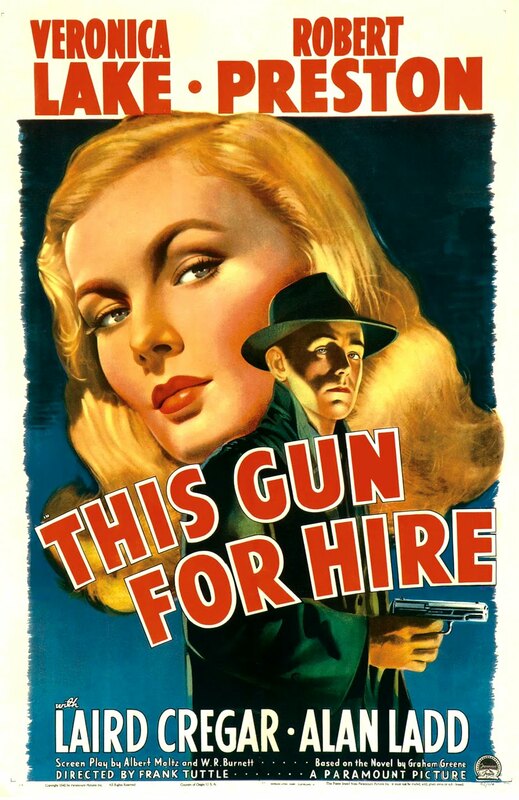 This evening's pictures included noir staple (and a personal favorite of mine), This Gun for Hire (1942) and a far lesser known film, Fly-By-Night (1942). The idea is that each bill is an A and B picture from the same time period in the history of noir, so you can see a growth in the genre's development. 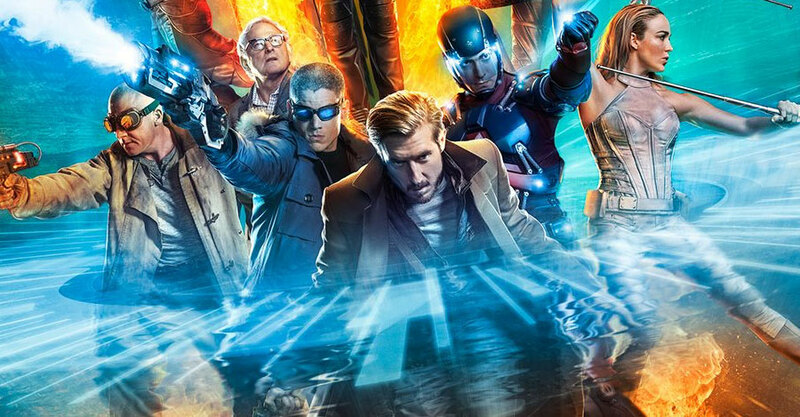 So, I guess that was "Legends of Tomorrow"
As I kind of suspected, DC's Legends of Tomorrow did start to feel less like a plodding mess in the final 3-4 episodes of the show. They had their beginning and they had their ending, but they didn't have a middle, and that was no good for anybody. Really, if we're being honest, the show made no sense. Time travel is a ridiculously complicated contrivance, and once you start making up arbitrary rules for your time travel story - rules clearly there so that the story can occur and not just end because you got in your time machine and flew back to the past and killed Hitler in his bed - you've kind of already lost the game. Especially when your time-travel device is also a space-faring vehicle. Since last I posted on the show, I've really been hate-watching it, because - and I am sorry earnest TV watcher who was truly moved by the unfolding story of Rip Hunter and his gang of renegade time-travelers - it got just hysterically bad at some point. DC Comics gets a new logo. So... this means... what, exactly? 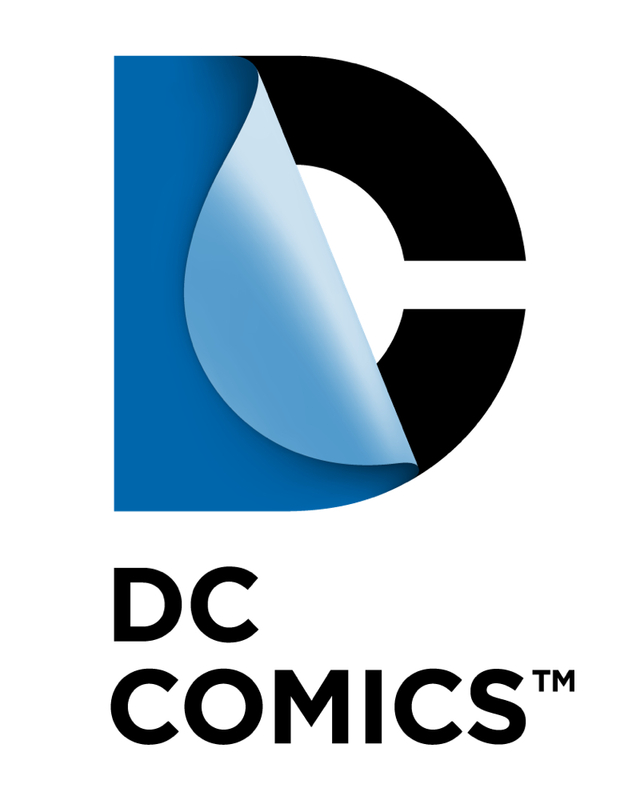 DC Comics has a new logo. It's certainly not as "we might sell paper like Dunder-Mifflin" as the last DC Logo. Or as hopelessly detergent-label-like as the prior. But there's not a lot of standards to go with in this realm. The big, chunky red Marvel logo isn't really... much of anything, either, so let's not get too excited in the compare and contrast department. the logo that screams "'fun', as defined in Appendix C of the PDF attachment in Tuesday's email"
Like a lot of other folks, I looked at the new one up top and said "huh, interesting they went Bronze Age with it". Because a bit of a throw-back to those early 1970's logos DOES say what you want to say to fans about respecting the past, and the fun of that past - something DC hasn't just had a problem with, but has aggressively trampled over the past 5 years. But it IS new-er-ish. They're not just endeavoring into a revival of a period which is remembered fondly, but would make no sense in 2016. Mostly, unlike the DC Fold, it's also squarely not the sort of thing that would look at home on a box of 3.5" diskettes in 1994, either. But maybe a loaf of bread from a company that hasn't changed it's packaging since, well, 1974. 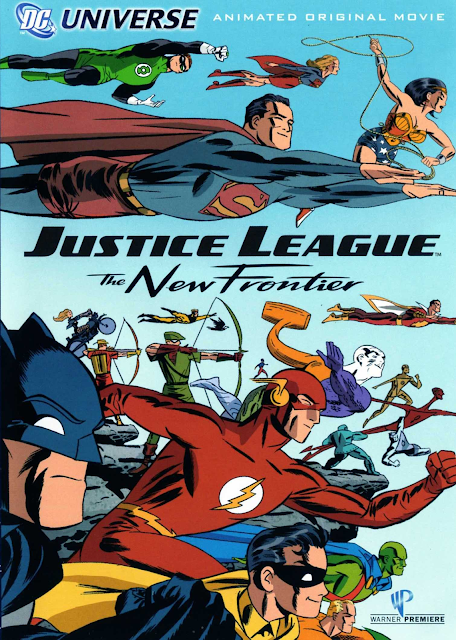 With the passing of Darwyn Cooke, I had my quick appreciation write-up, and on Sunday, as I was eating my oatmeal and pondering the fact I had to work all afternoon, Jamie pitched watching the animated version of Cooke's comics classic, Justice League: The New Frontier (2008). For a while there, I was purchasing every single new DVD WB Animation pushed out as DC got into the feature-length animated film business. These days I limit my actual purchases (my last purchase being Flashpoint, which seemed as good a place to jump off DC Entertainment in many-a-ways), but I have a pretty good run of Batman, Superman, Green Lantern, Wonder Woman and Justice League videos. And, as I type this, why the hell didn't they ever make a Flash movie? It seems like an obvious fit. But I don't think I'd actually watched this disk in something like 6 years. 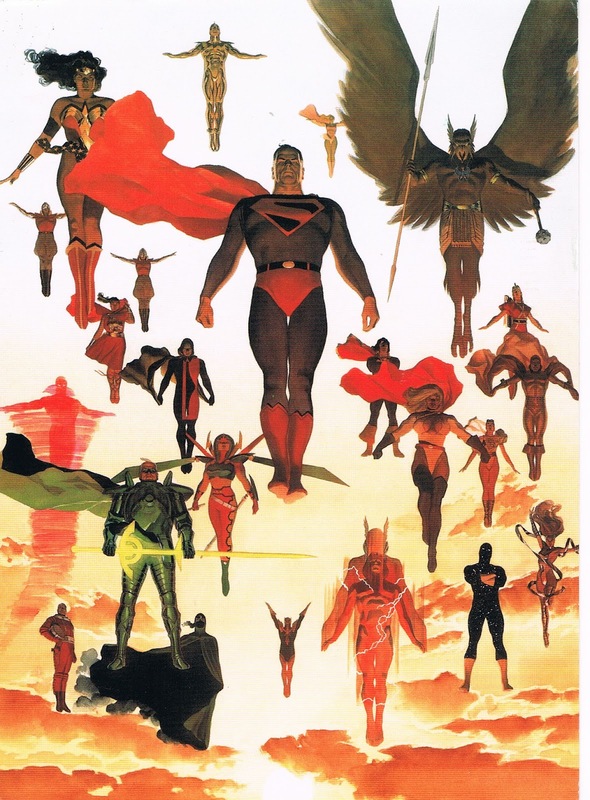 20th Anniversary of DC Comics' "Kingdom Come"
This month marks the 20th anniversary of the release of the first issue of Kingdom Come, the prestige 4-issue, oft re-issued, comic by creators Alex Ross (artist) and Mark Waid (writer). It's extremely difficult for me to state how much of an impact this comic had on me as a reader at the time of it's release. In fact, I'd argue it was one of the comics that came out at a particular time in my life that tilted me from an interest in comics and enthusiastic readership to... whatever it became. 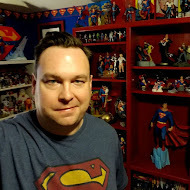 Further, I'd say that Kingdom Come stands as one of the key books that pushed me from thinking Superman was pretty neat to... whatever my deal is with The Man of Steel today. By 1996, I just wasn't that interested in superhero comics. It seemed like a lot of books were trying to pull things off that weren't working, and, honestly, at age 21, glancing over the covers - a sense of creeping embarrassment hit me for the first time in my life in regards to comics. Not for the hobby or comics themselves, but it seemed that, in the mainline superhero books, writers and artists and the companies themselves had a vision they were trying to execute, and that vision felt like a 13-year-old trying on their dad's suit thinking they could con the bank into giving them a loan. Meanwhile, Karen Berger had set up Vertigo at DC and was putting out Hellblazer, Shade: The Changing Man, Animal Man, Swamp Thing, The Invisibles, and, of course, Sandman and Sandman Mystery Theatre. I didn't think I had to look too far to see characters who were telling me they were for older readers - they simply were the sophistication (or what passed for it) that felt like the proper heirs to the Moore legacy.